Since March 19, large parts of Iran have been affected by heavy rainfall that caused disastrous flash floods. A large number of people have lost their lives and an even bigger number of people have been injured or have lost their homes to severe damage. Report indicate that the regime has tried to cover up the extent of the devastation and conceal the real numbers of casualties. It has been reported that journalists have been blocked from entering hospitals so that they cannot write or speak about the number of killed or injured. State-run news agencies are reporting that the death toll from flash floods across the country has risen to 44 from 17. 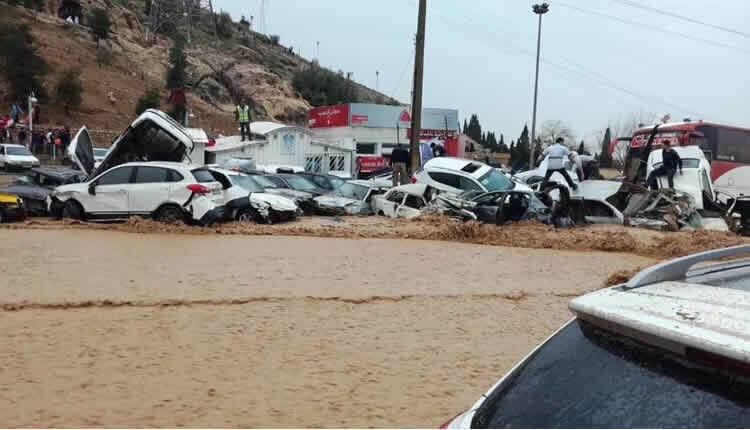 Iranian news agencies have also announced that 200 automobiles that were on the road during the flash floods were swept away. Most of the cars had passengers inside, therefore the number of casualties announced by Iran is obviously false. Videos of the extensive damage in other areas of the country are also being shared and the desperation of the people is palpable. Some are taking refuge on the rooftops of buildings. Landslides are blocking roads across Iran and villages are being cut off from the rest of the country. Clean water supplies have been cut and many people do not have access to potable water. Locals in different cities and towns are complaining of continued inaction and incompetence from the authorities. Lotfollah Dezhkam, Friday prayer imam of Shiraz, south-central Iran, acknowledged the fact that anger among Iranians is escalating over how the regime has plundered their country’s wealth and left them defenseless in recent floods. “During my inspection of the flood-hit areas, we faced growing anger among the people. I personally heard many insults and I am very angry. I have to see what the municipality has done to the people. When the municipality has violated river areas for their projects, what else do you expect from the people? I have seen the municipality violate these limits in two or three different areas,” he said in remarks posted by the state-run IRNA news agency. “The flood victims are very angry over the lack of action seen from various officials,” he added at a meeting on Tuesday night with the head and officials of the regime’s so-called Housing Foundation. “They have turned waterways in to buildings. Of course, floods will result. Why has the municipality built a boulevard and blocked the waterways? Water from above Quran Gate has nowhere else to go and it is obvious that floods will result,” he said. “The tunnel built by the municipality in the Sa’adi district has now turned into a river. This tunnel has no waterway. Where the municipality intends to construct a park in the future has water rising two meters. I witnessed very miserable scenes during the flood in Shiraz,” the representative of regime Supreme Leader Ali Khamenei continued.